There is a saying that muscles are made in the kitchen, not in the gym. Both are important for overall health but many people end up training too hard and ignoring the diet aspect. The truth is, even the most flawless training regimen will fail if you aren’t eating properly. Proper diet will not only give you energy and fuel your body but most importantly it will help your body heal after a workout. EIMD or Exercise-Induced Muscle Damage can easily happen after an intense workout. While your muscles can heal from this soreness on their own, diet changes can speed up recovery so you can be back in the gym ASAP. While a well-rounded diet that focuses on vegetables, lean meats, whole grains and fruits will keep you on track for muscle growth, there are certain foods that are particularly good for recovery. Here are 10 different foods you should try for your post-workout meals. Blueberries are little powerhouses of antioxidants and anti-inflammatory chemicals. These properties include tannins, flavonols, anthocyanins, resveratrol and more. Blueberries help reduce DOMs, or Delayed Onset Muscle Soreness, but also help muscles recover faster overall. Eating a handful of blueberries after a workout is a great idea. Others choose to add blueberries to their post-workout shakes instead, though there is some belief that whey protein may inhibit the full antioxidant power of blueberries when combined. Salmon is an amazing food source for refueling after the gym. This fish is rich in omega-3 fatty acids which have many health benefits. Eating salmon will reduce muscle inflammation, improve cell generation and help your muscles return to their normal state more quickly. Salmon is an amazing source of lean protein. Try to choose wild-caught salmon, as farmed salmon tends to lack in omega-3s. If you’re not a fan of salmon, cod or tuna are other good options. The healthy fats and oils from fish really shouldn’t be skipped. If you’re not a fan of fish and can’t find a recipe that works for you, consider taking a fish oil supplement. Almonds are an excellent nut to eat since they offer higher amounts of protein and fiber than most other popular varieties. 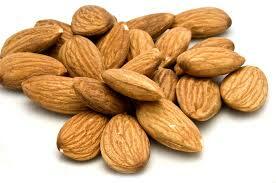 Strive to eat only raw almonds whenever possible, to get the maximum nutrition. Just a small handful of almonds has about 160 calories and 6 grams of protein. These nuts are high in vitamin E, which helps eliminates free radicals in the body. Almonds are also high in various B vitamins, making them perfect for muscle recovery and increased growth. Eat a handful of almonds post-workout as a snack while you make your actual meal. 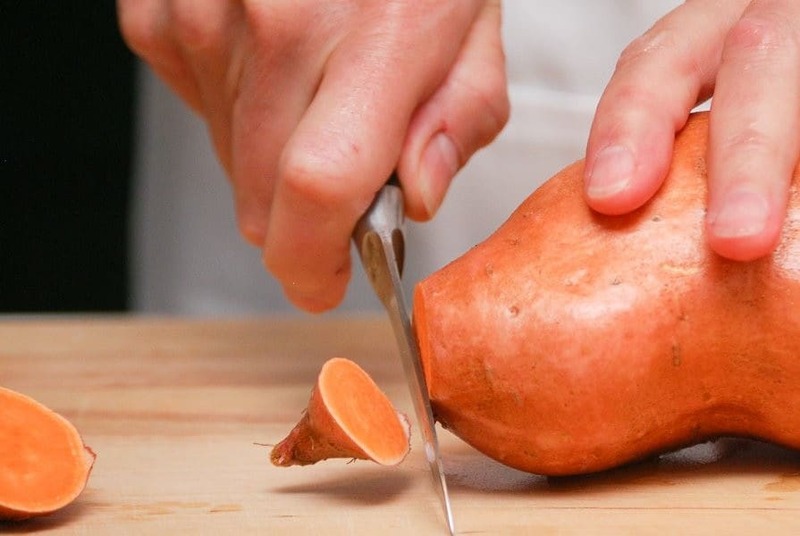 Instead of relying on regular potatoes for muscle recovery, try out sweet potatoes instead. Sweet potatoes are high in potassium and magnesium, which both help to reduce muscle cramping and overall soreness. The orange color is a dead giveaway for its high level of beta-carotene and vitamin C.
Sweet potatoes take longer to digest since it’s a complex carb. This means the sweet potato will replenish your deplete glycogen stores and continue to refuel your body so you are ready for your next workout. It should be more widely known by now that not all fat is bad. In fact, consuming healthy fats regularly is important for overall brain health and lean muscle growth. Avocados are a delicious and easy way of getting good fats into your diet. Just one avocado contains 250 calories, 10 grams of fiber, 15 grams of fat and more than 20 different essential nutrients. The fat in this fruit is monounsaturated, which keeps muscles toned with improves muscles growth. Avocado is also rich with antioxidants, so your body can heal its muscles faster. Eggsare often called a perfect food, and for good reason. A single large egg has 6 grams of protein, vitamins A, E, K and various B vitamins like B12. It also has riboflavin, folic acid and all of the 8 essential amino acids needed by the body. Eggs help with muscle recovery and building. They are also rich in minerals like calcium, iron, and zinc. There is a seemingly never-ending way of preparing this food as well. You can scramble, fry or bake them. Maybe make an omelet loaded with vegetables and some shredded chicken. Some people choose to eat eggs raw, though there is no proof raw eggs are any more nutritious than cooked eggs. There are about 5 grams of fat in a whole egg, with about 1.5 grams being saturated fat. For this reason, some choose to eat just egg whites on a regular basis. It’s safe to say that majority of people do not eat enough vegetables. Vegetables are important for muscle growth, with leafy greens being extremely useful for muscle recovery. Like many of the other foods on this list, leafy greens are recommended due to their high levels of antioxidants and ability to control free radicals. Spinach, kale, collards and other greens should be a staple. Avoid cabbage, iceberg or romaine as sole source of greens. Grilled chicken breast is the traditional muscle-building, post-workout meal standby. It can get boring if it’s all you eat but that doesn’t make it any less of an essential protein source. A single 6 oz serving of boneless, skinless chicken breast gives a whopping 54 grams of protein and 4 grams of leucine. It is the perfect foundation of a post-workout meal, especially when combined with other foods on this list. Chicken breast is just so versatile and easy to cook, it’s a no-brainer. Any meat eater striving to gain muscle should have chicken breast on hand. Cruciferous vegetables are great for post-workout muscle recovery, with broccoli being a popular choice. This high-volume vegetable is best consumed after workouts since it is high-volume and will make you feel full more quickly. There is two reasons broccoli is important. First off, it reduces estrogen in the body. Since estrogen can have negative effects on the body after a workout, eating broccoli is an excellent idea. Secondly, it is loaded with various antioxidants that offer numerous health benefits and has muscle-healing properties. Try to eat broccoli as a side dish to your main meal, either steamed or baked rather than raw. Kimchi is definitely not the first food you’d think to consume post-workout but if you haven’t tried this fermented Korean dish, you should reconsider. It is traditionally made of napa cabbage, onions, carrots, garlic and other vegetables. It is loaded with spices, varying from mild and sweet to spicy and hot. The fermentation process it goes through makes this dish explode with beneficial bacteria. Gut health is important for overall health and thereby is important for muscle recovery. By eating Kimchi regularly with meals your body will be able to more efficiently absorb nutrients and prevent fat gain while protecting muscle. Sometimes eating a full snack isn’t an option. That’s where super efficient supplements come in. Taking the right supplements can help to increase muscular growth, but it will also speed up post-workout recovery. With a good supplement, your muscles will be back in optimal condition next time you hit the gym. Protein is the most important of the post-workout recovery supplements for one simple reason: your body needs protein in order to repair/expand your muscles. Whey protein is a great pre-workout supplement, but it’s just as good for post-workout. It’s bioavailable, meaning your body can easily absorb and put it to use. It’s also a fast-acting protein that won’t take too long to digest, and it can start working on repairing your muscles right away. A post-workout whey protein shake can help to reduce muscle soreness, but it will also contribute to muscle growth. Whey protein will also keep your metabolism firing for longer after you work out. It’s especially important if you do a resistance training workout—one that causes a lot of microdamage to your muscles. If your goal is weight loss, try a “Lean Muscle” supplement. It delivers a good dose of protein, but it also contains a higher dose of carbs than regular bulk-up protein. Those carbs will suppress your appetite and deliver the energy your body needs after an intense workout. A post-workout protein shake will get you back on your feet ASAP! Our recommendation: Try CytoSport Muscle Milk Lean Muscle Protein Powder as a good post-workout protein powder. It contains more carbs (9 grams per serving), so you get that boost of energy. You also get a solid 16 grams of protein per serving to help repair your muscles. Best of all, it mixes easily, doesn’t have that grainy texture you hate and tastes pretty great! BCAAs, or branch chain amino acids, are potentially more effective as a post-workout recovery supplement than even protein powder. Why is that? Simple: because of three little amino acids! These three amino acids make up 66% of the protein molecules your body uses to build new muscle tissue. Essentially, they’re the most important component of muscle-building. But they also help your body to send amino acids into your bloodstream, and thereby to your muscles. These three amino acids help your body absorb all amino acids more quickly, prevent muscle breakdown (catabolism), and protect your muscle mass (particularly for those who do a lot of cardio training). All protein powders contain these three amino acids, but only BCAA supplements contain them in such high quantities. Alone, a BCAA supplement won’t lead to effective muscle-building. However, pair them with plant-based proteins (like beans, brown rice, quinoa, etc. ), and you get plenty of these very important amino acids. Our recommendation: Try the BPI Sports Best BCAA Powder as a concentrated source of these three important amino acids. Not only does it have a unique flavor (Watermelon Ice), but you’ll find it’s one of the best BCAA supplements in terms of both quality and price. Beta-alanine is another important amino acid, but let’s be clear: it’s not one of the nine “essential” amino acids your body needs to build muscle. If your goal is sheer muscle mass, a beta-alanine supplement isn’t going to help. But what it will do is help you recover from your workout more quickly. Why? Well, beta-alanine is needed (along with histidine) in order to form carnosine. Carnosine is a compound that reduces the hydrogen ions that form in your blood, preventing your pH from becoming too acidic. Carnosine keeps your pH levels balanced, delaying muscle failure and fatigue. A healthy pH also makes it easier for your body to recover, as there is less damage to your tissues and muscles. Note: Carnosine DOESN’T buffer against lactic acid. Lactic acid is an important part of the energy cycle, and carnosine will not affect it. It only helps your body to avoid becoming too acidic. Beta-alanine is one of those supplements to take after your workout is over. It will speed up recovery and protect your body from becoming too acidic, making those muscle repairs easier and quicker. Our recommendation: Try BulkSupplements Pure Beta Alanine Powder if you want to take beta-alanine to your post-workout routine. It may be a bit pricey (almost $14 for just 250 grams), but it delivers a pure, clean source of beta-alanine that can help to speed up recovery. It’s ideal for preventing the post-workout fatigue that sets in after an intense workout. You may be wondering, “How the heck can juice help to prevent soreness and speed up muscle recovery?” Well, it’s not just any juice—it’s tart cherry juice! Cherries contain a lot of phytochemicals, antioxidants that will help to protect against oxidative stress and free radical damage. But those antioxidants can also strengthen your heart and, best of all, reduce post-workout muscle soreness. In a 2010 study, it was discovered that cherry juice helped to speed up recovery and reduce inflammation after a workout. Less inflammation means your body can send more blood (carrying oxygen and nutrients) to your muscles, speeding up the repair. It will also help to reduce muscle soreness, which is caused by the swelling of your damaged muscle fibers. Of the marathon runners that participated in the study, the ones who drank tart cherry juice on the day of and 48 hours after their race recovered isometric strength “significantly faster” than the runners who did not. The cherry juice also reduced inflammation and sped up recovery. Our recommendation: Try Dynamic Health Organic Certified Tart Cherry Juice Concentrate as a great way to prevent post-workout soreness. The cherry juice is 100% certified organic, and it delivers a hefty dose of antioxidants to speed up muscle recovery. The fact that it’s concentrated means that the 16-ounce bottle can make a few quarts of cherry juice. All in all, it’s a well-priced product that delivers results! Bonus: To seriously reduce post-workout inflammation and soreness and speed up recovery, STRETCH! Spend a few minutes stretching at the beginning of the workout, and end with 5-10 minutes of stretching to cool down. The stretches will increase blood flow to your muscles, getting the recovery processed started before you ever leave the gym. Post-workout meals are one of the most important meals of the day since your body will be craving fuel after a rigorous workout. Don’t be afraid to experiment a bit and try squeezing in as many muscle-supporting foods as possible will have you seeing results more quickly. Protein shakes and other supplements have their place, but nothing is more important than consuming whole foods.